Bognor held on to a point at the Prokit Stadium in a stalemate in which they defended very well and battled hard. The result keep them in the play-off zone although they drop to fifth ahead of a big game next Saturday at home to fellow promotion chasers Haringey. The main absentee for Bognor was midfielder Richard Gilot with a groin problem. Mason Walsh got a start, while Calvin Davies returned to the substitutes bench following his knee injury. Theo Widdrington's early pass towards Dan Smith didn’t quite pay off as it rolled harmlessly through to Arthur Janata. Ben Worman was on the end of an inswinging free-kick from the right but he knocked it wide on the volley from Chris Gregan's ball in. Walsh did well cutting inside and his pass to Bradley Lethbridge allowed him to get into a good position but his shot was high and wide. Worman committed Dan Lincoln into a save with his left-sided cross. Good play from Doug Tuck saw him find Lethbridge but he left it for Jimmy Muitt, whose deflected strike was easily saved by Janata. Gregan's long throw forced Lincoln to punch the ball away before Smith miscued his chance at the other end following good work from Muitt and Harvey Whyte on the right. Ed Sanders had to block George Craddock's left-footed strike before Lincoln had to punch clear a corner on 16 minutes. Ryan Henshaw was booked for a challenge on the turn on 20 minutes when Smith was brought down. Widdrington's free-kick was hit with venom but straight at Janata. Craddock swung a corner in but Henshaw was blocked with his header near the back post on 28 minutes. Craddock was denied by the fist of Lincoln from his corner. Johnville Renee went to ground in the Rocks box but the referee gave a goal kick. Luke Callender shrugged off Chad Field before finding Craddock but he was blocked by Harvey Read, before a Lethbridge cross was cut out. 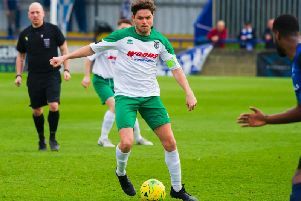 Bognor's best chance of the half saw Walsh beat his man before passing neatly inside the area for Smith, and he diverted it towards goal and it forced a reaction save from Janata on 36 minutes. Early in the second half Craddock picked out Worman, who knocked it wide with his left foot on 48 minutes. Lethbridge stubbed his shot straight Janata then Bognor had to keep out Renee. Lethbridge got on the end of the forward pass by Widdrington to knock it over the goalkeeper but agonisingly wide using his head. Lincoln denied Craddock with his direct free-kick before Smith's strike was deflected wide on 59 minutes. The resulting corner by Muitt picked out Read, who headed it wide. Muitt flicked on for Smith before he spun his defender and smacked it disappointingly high and wide his left foot on 61 minutes. Worman rattled the crossbar when Mason had played him in with a short pass on 65 minutes. Whyte went into the book on 70 minutes when a loose ball ended up with him sliding in late on Renee. Muitt made great ground before shooting from the edge of the area and it bobbled slightly before Janata dived to his right to save it. Jack Thomas combined well with Mason before belting it wide. Tommy Scutt replaced Sanders before Mason twisted and turned but curled a shot wide. Mason's corner from the right picked out Henshaw but he glanced his header wide on 79 minutes. Whyte won a free-kick on the far right and his low ball found Muitt but his first touch strike was low and easily saved by Janata. Lethbridge headed it wide from Whyte's right-sided cross as he couldn’t quite get there on the far post on 87 minutes. Mason's scissor kick failed before Mason was denied with a brave block. Lethbridge went to ground in the area following a challenge after a sprint into the area from the Pompey loanee but the referee ignored the penalty claims. It was difficult to watch at the end as Rocks had to battle on for another four minutes of stoppage time. But steadfast defending from the entire back line saw them all put their bodies on the line to give Rocks a valuable point on the road. Rocks: Lincoln, Sanders (Scutt 74), Walsh (Davies 57), Tuck, Field, Read, Whyte (c), Widdrington, Smith, Muitt, Lethbridge. Subs not used: McCormick, Heath.